The book Peak showed me that anybody can do anything, because it’s about a kid that’s 14 and is climbing skyscrapers illegally then goes and climbs Mount Everest. You already know that because you wrote the book, but this is probably one of my favorite books. I also like that the kids name is Peak. I thought that was pretty cool, because when I was first reading it I thought it was just about the peak of the mountain then I read that people were calling him Peak and about his dad Josh. I thought it was cool that he was climbing with Peak. When I was reading the book there was a lot of stuff about climbing, so I was searching all this stuff, and it was cool for what came up, for example a gamow bag. I thought this story can show you what fear is because climbing up that mountain could be really scary depends on the person I guess, I saw this movie called Everest and they said when you are getting close to the top your body is practically dying because of how high you are climbing. I also have a question for you did you ever get into climbing? I just thought I should ask that question since you wrote a book about climbing. I don’t think I ever read any other books that you wrote but probably should since I love this book so much. Well I am glad that I could write this later to you hope you read it! I was wondering if you could come to my school, Rock Creek Elementary over by tanasbourne, part of the beaverton school district. I am asking this here because I am a student and my email doesnt work in the oter post box. Hope you could get back to us! Dear Roland Smith, I just finished the book peak as a outside reading novel for English class. This is by far one of the best books I read and I hate to read. Funny huh, this book was so great I forced myself to put it down to finish other school work. 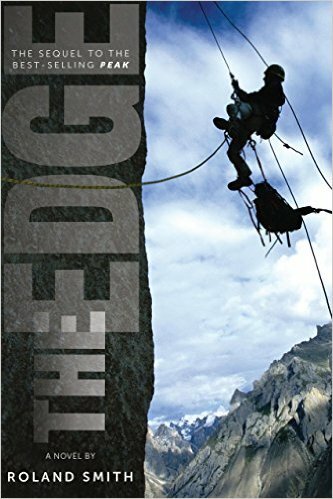 I’m so excited to get The Edge to read about Peak again. I liked this book so much. Please make a sequel to The Edge and PEAK about climbing the Matterhorn, or Mt McKinley, or possibly Kilimanjaro using the important characters including Alessia, JR, Jack, Will, Peak’s dad, and Zopa. Please consider it would be a great read. I loved the way Peak was continually learning new information about his mom. Sometimes we think of parents as being “just” parents. I liked learning his mother’s talents along with Peak. I enjoyed reading both “Peak” and “The Edge” so please right a third book to put my mind at ease. Both books had me hooked. Dear Roland Smith, this was a very well thought out book, and it was amazing to read, the ending was extremely pleasant, and I wish for you to write a third book in the series which includes all the important characters, and they climb one or more of the seven summits, maybe even a little romance between Peak and Alissia. Please take this into consideration, thank you for your time, and have a nice day. Love ur books man, especially Mutation. Keep calm, and stay writing my man! On the chapter called The Team, what was the website that Peak looked at to see the summits of Everest? If there is a website. Please and thank you. im in 7th grade west middle school in idaho nampa i wish you could visit. im reading peak i have not even made it through the first part and i already love it. Will there be another about Peak? Yes. I’m working on the 3rd book. It will be called ASCENT. Out in 2018. Hi I’ve currently read two of your books based off Peak Marcello, and I absolutely enjoyed the parts where Peak talked about his family’s past. It would be really good to see about their family’s past we could learn more about characters such as Rolf, Joshua, and Teri, how Joshua wasn’t mellow the time he was with Teri, more about Teri’s accident, how Josh felt about Teri’s pregnancy, Rolf and Josh relationship, etc. I love your books a lot, and look forward to read Ascent. Hi Jamirah, I’m delighted to hear that you have enjoyed the Peak books. I am busy working on the final book right now as I write this.